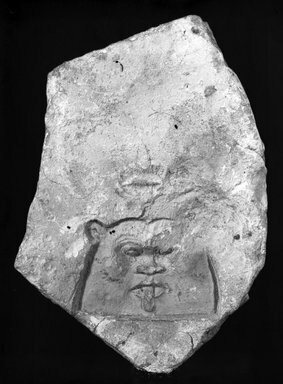 Limestone sculptor’s trial piece. At base of upper surface, in sunk relief, head of Bes with protruding tongue, no headdress. Directly above this head, rough outline of duplicate mouth and nose of same subject; balance of surface plain. On underside, a few tool marks. Condition: Poor. Fragments at base of upper surface apparently broke loose and were reset. Upper left portion of head lost.